There have been a lot of exciting changes here at Marianne Simon Design and I honestly couldn't be happier! I'm very excited to announce that we have moved into a new studio! We are now located in an area of Bellevue called Old Main. It has been a dream of mine to have a studio on this street. The street is lined with the most amazing shops and restaurants and could not ask to be in a better location. It's such a treat to walk out our door and be part of this community. If you follow me on instagram @msimondesign you will have already seen a few sneak peeks of the new space. I am so grateful to have 1,000 square feet of studio space which also includes a separate room for our fabric library. Truly a dream come true! I will try to get some images up of the new studio soon and give you a tour, but right now we're still waiting on some backordered furniture to arrive. Story of my life! 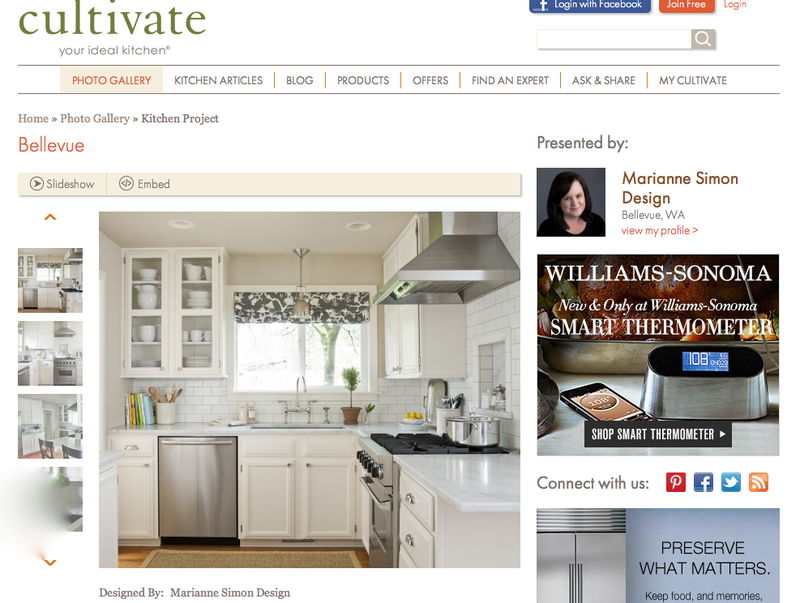 In the meantime, I was so honored when Cultivate, part of Williams-Sonoma, contacted me to feature my kitchen on their website! They interviewed me for the article which you can read in it's entirety here. As a designer, it's always nice to have your work recognized! Thank you, Cultivate!